We are getting close to the 1-year mark. Charlotte just turned 9-month, 3/4 year! She is definitely growing and able to do more every day, which is fun. But her expectations are also changing. She is almost ready to crawl, to stand up and walk. But she can't do it yet, and it's frustrating her a lot! No surprise, though. She is a heavy baby: she ranked at 99%-tile in weight and length during her 9-month visit. She has to learn to move all this weight. Gone are the days when she was just happy playing on her playmat for hours. She is now interested in everything she hasn't explored before (in particular Daniel's toys what have small pieces and our kitchen cabinets!) So, she constantly asks for our help to get up and try to walk to these objects she is so curious about. I am very impatient for her to be completely self-sufficient. It's frustrating for all of us right now: for Charlotte because she doesn't get to do what she wants, for us because she requires a lot of attention and for Daniel because he is stuck waiting for us a lot. But Charlotte is very close. I hope that within the next few months, she will be able to move by herself. And then, other problems will start! Socially, Charlotte is doing really well. Her separation anxiety didn't last very long, fortunately. I think that the Jamaica vacation with a lot of new people forced her to deal with strangers very quickly, and to realize that she could do well without me. 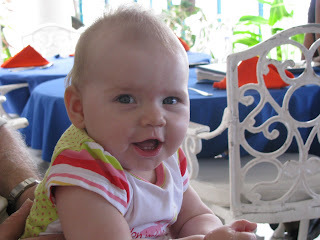 She is usually very happy to see anyone and she loves to waive, laugh and babble to people. Her teachers at daycare call her the entertainer of the classroom. She is also starting to interact well with Daniel. She laughs when he made jokes and she tries to make him laugh. This is very cute. Charlotte is babbling a lot these days. We haven't recognized any specific word yet (although "Daniel" will most likely be her first real word), but she is definitely practicing a lot!